Now that GiGi has hit the 8 month mark, she can try a much bigger variety of foods so I experimented and tried out a few things. 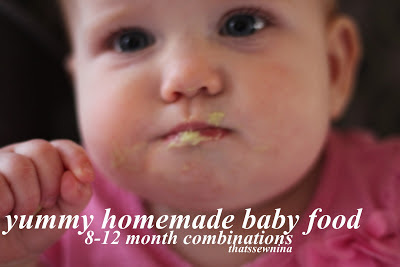 Check out some of her favorite concoctions (or my previous post on making baby food!). Some things so good even mom and dad could give them a try! Steam up two sweet potatoes to a soft consistency. Boil 1/2 cup of dried lentils according to package directions. Blend the sweet potatoes to a relatively smooth consistency. Mash up the lentils with a fork. Stir to combine. Chicken or beef also go great with this. (Poach the chicken or beef and toss it in a blender with some water just like you would vegetables.) Once babe is ready for finger foods, just mash up the sweet potatoes with the lentils to keep it chunky for those little fingers. Steam up two cups of broccoli and one medium green apple. The apple just needs to be softened so if you are steaming them together, steam the broccoli for a few minutes before you add the apple. Blend them together to a smooth consistency. Super simple! Just mash up half of an avocado and mix with two tablespoons of cream cheese. This was one of my favorites from when curly girl was little. Combine flour and cereal. Mix in banana, oil and water until it forms a non-sticky dough. Pat out on a floured surface to a 1/2" thick. Cut into bars and smooth out the edges. Bake at 425 degrees for 10-12 minutes on a greased or parchment papered cookie sheet. Allow to cool and harden.